A microsurgical procedure called Microvascular Decompression (MVD) is an option for those cranial neuralgia patients who are not otherwise medically ineligible for open surgery. MVD surgery addresses the root cause of the neuralgia, a blood vessel compressing the cranial nerve(s). As such, MVD is the only treatment offering pain prevention rather than simple symptom relief. In an MVD, a surgeon trained in the procedure accesses the cranial nerves through a surgical opening in the skull (craniotomy) behind the ear. The surgeon carefully lifts the offending vascular structure from the cranial nerve(s) and gently inserts Teflon padding between the blood vessels and the nerve, preventing further damage. Although not a cure, until better treatments are developed, MVD is a cranial neuralgia patient’s best hope for lasting pain relief. Anesthesia dolorosa and/or trigeminal deafferentation pain cannot be treated with microvascular decompression. These conditions are not caused by compression of the nerve, therefore decompression is contraindicated and could potentially make the pain worse. Also known as the Jannetta Procedure, MVD was pioneered in the mid 1960’s by the late Dr. Peter J. Jannetta. This procedure is designed to address the cause of TN in 95% of TN patients. If it is successful, the recurrence rate is only 10-20% over 10-20 years. As a result, it offers a chance at durable, long-term, or even permanent pain control. MVD works best for sharp, stabbing, electric-shock-like pain. For this type of pain up to 80% of patients can be initially pain-free. Unfortunately, it is far less successful for constant, dull, aching or burning pain where success is often defined differently, as a 50% reduction in pre-operative pain levels. Even for this loosened definition of success, success rates for MVD for this type of trigeminal pain is often estimated at 50-67%. It’s success rate for patients without TN1 or TN2 is even lower. MVD is also the surgical procedure where success rates seem to vary the greatest among surgeons, depending on their personal training and experience levels. The success rates of less experienced surgeons are considerably lower than those of surgeons with more training and experience. For Microvascular Decompression, studies show that surgery performed early is more successful than those performed long after diagnosis. MVD carries the same risks as any other brain surgery and not everyone is a candidate for general anesthesia or open cranial microsurgery. 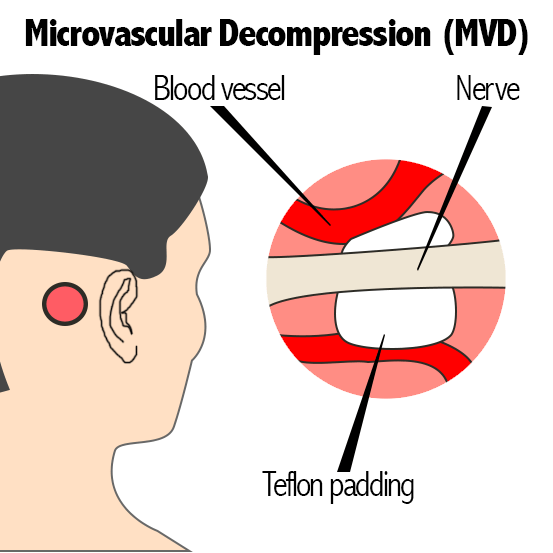 Fred G. Barker, M.D., Peter J. Jannetta, M.D., D.Sc., David J. Bissonette, P.A.-C., Mark V. Larkins, M.D., and Hae Dong Jho, M.D., Ph.D.
“The Long-Term Outcome of Microvascular Decompression for Trigeminal Neuralgia” New England Journal of Medicine (334:1077-108) 1996. Chen, Guo-qiang et al. “Arterial Compression of Nerve Is the Primary Cause of Trigeminal Neuralgia.” Neurological Sciences 35.1 (61-66) 2014. Yang, De-bao et al. “The Efficacy and Safety of Microvascular Decompression for Idiopathic Trigeminal Neuralgia in Patients Older Than 65 Years.” The Journal of Craniofacial Surgery 25.4 (1393–1396) 2014.